When presenting our work in churches in the US, I am often asked how we translate into local languages things for which the local language does not have a word. That is one of the key issues in Bible translation into the languages of the world including those in Congo where we work. Joel and Gilbert are Congolese translators. (They are in the front row of the picture with Dayle. In the back row with Ed are two men responsible for teaching people to read in Mayogo.) Right now they are translating the book of Revelation into their language. Revelation contains lots of items which are unknown in much of Africa including silk, cinnamon, and gemstones. So they had to deal many times with items which are unknown to those who will read their translation. One of them was “linen”. One of the translators first proposed translating linen as “clothes sewn from animal fur”. That provoked a discussion which led Gilbert and Joel to do further research. They then decided the most important thing to convey to readers was that this material was of good quality. This was deemed more important than where it came from. So the translation “high quality cloth” was entered into the draft translation. When the draft was getting one of its obligatory quality checked, the consultant doing the check suggested looking at how Gilbert and Joel had translated “linen” in other books of the Bible. (They have translated over 70% of the New Testament.). It turned out that “linen” had been translated in various ways. The linen sheet in which the body of Jesus was wrapped had been variously translated: sheet made from linen (the borrowed word from French ‘lin’ had been incorporated into the language as ‘lene’), sheet of great price, or just sheet. All of these possibilities have some merit. But, in order to be consistent in their translation throughout the whole New Testament, Gilbert and Joel decided to translate linen each time by ‘sheet/garment of great price’, . They then put other information in a footnote. In this way, the understanding of the text itself was not hindered, but for those who wished to pursue the matter further, some additional information was given. As this story illustrates, translating unknown terms has an important side issue which also needs treatment. We do not do translation ourselves. 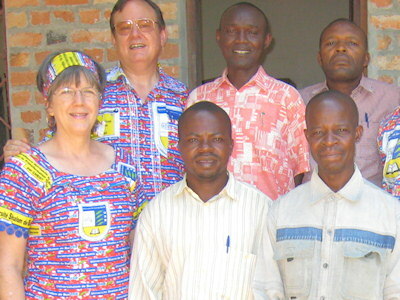 Rather, we are training Congolese and mobilizing their churches for Bible translation. There are many good reasons to do Bible translation this way, including the fact that the Congolese translators know their cultures and languages better than we ever could, and so can produce better translations. But this approach does present some challenges. When the language of a Congolese Bible translator does not have a word for something, it is likely that the translator himself has never seen the thing. At best, he may have traveled outside Congo and have seen the thing, but in many cases he will only have read about it in a book without even seeing a picture of it. That is why we equip Congolese translators with a complete range of reference works which they can consult to research these items. Nowadays, the whole reference library fits on one laptop computer! So Gilbert and Joel opened their laptop computer and did the research necessary to get an accurate and understandable translation right there in their fairly remote location. By the way, we are looking for someone who knows computers and who likes to help end users because we have lots of Congolese to train in computer use so that they can use these tools. For those of you interested in more theory about translating unknown terms, here are some explanations. The rest of you probably want to stop reading right here. When translating any word into another language, it is important to break the meaning of the term into all its components. In the example above two components of “linen” come out: the material the cloth is made from and its price. There are other characteristics or components of meaning which are included in “linen’ but which the translators did not consider such as its color, its weight (is is a cloth for cold or hot weather) or its customary usage. Once all the components of the word are listed, then the translator needs to ask which component/components is/are in focus in the passage being translated. In some cases, the passage makes that clear as in Revelation 19:8 which reads “And to her was granted that she should be arrayed in fine linen, clean and white: for the fine linen is the righteousness of saints.” The adjective “fine” and other elements of the passage indicate that the feature of linen in focus is that of a costly dress-up garment. A translation which does not make that component of meaning available to the reader, by a footnote or other means, will not be understandable. English speakers who read the Bible have great advantages. They have access to dictionaries, encyclopedias and other reference works where they can look up words like linen, chalcedony, sardonyx, sardius, chrysolyte, beryl, topaz, chrysoprasus, and jacinth. The readers of the translation Gilbert and Joel are doing will have not such advantages. Instead, they are dependent on Gilbert and Joel’s hard work and research to give them a translation they can understand in their context. God first gave his people his Word in a language they fully understood using words with which they were fully accustomed. We Bible translators must respect God’s choice in that matter, even if it causes us more work. This entry was posted in Bible translation, National translators and tagged Bilbe Translation, translating unknown terms, unknown terms. Bookmark the permalink.